When you're looking into your options for a full-sized sedan to drive around Duluth, consider the 2019 Ford Taurus. NorthStar Ford can show you the various makes and models that will let you stand out in the crowd wherever you're driving. 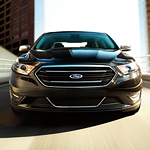 The Ford Taurus is filled with design features that are stylish and sleek. In the front, a SHO grille is made from an eye-catching black mesh that is lined with a smooth chrome. In the rear, dual chrome exhaust tips top off the sculpted appearance of the entire vehicle. For visibility, the Ford Taurus has bright front and rear lights. In the front are HID headlamps that turn on whenever they sense darkness. To increase your visibility in the rain, they'll also turn on when the windshield wipers are going. They're designed to fully integrate with the smooth lines of the vehicle.